Employees who are resigning over hostile work environments or harassment can use this letter to file a formal complaint at the same time. 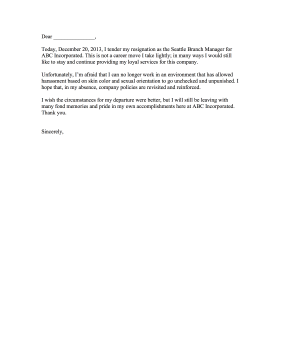 Today, December 20, 2013, I tender my resignation as the Seattle Branch Manager for ABC Incorporated. This is not a career move I take lightly; in many ways I would still like to stay and continue providing my loyal services for this company. Unfortunately, I'm afraid that I can no longer work in an environment that has allowed harassment based on skin color and sexual orientation to go unchecked and unpunished. I hope that, in my absence, company policies are revisited and reinforced. I wish the circumstances for my departure were better, but I will still be leaving with many fond memories and pride in my own accomplishments here at ABC Incorporated. Thank you.